1. PE stretched net and flat net making machine are specially design for high production requirements. They provide high productivity, high accuracy, and exceptional fine surface on the nets. 2. 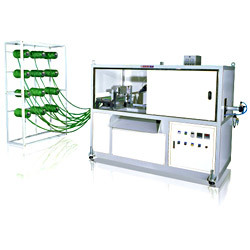 The entire machine motions are controlled by the high performance controller for convenient operations. 1. The screw is precision machined from high quality alloy steel SACM-1 with nitrogen treated for high performance and duration. 2. The screw has high L/D retio up to 28:1. ensuring high extruding capacity. 3. Automatic temperature control.